IFA 2011: Samsung hit by Galaxy Tab 7.7 ban in Germany | What Hi-Fi? Samsung only unveiled its new Galaxy Tab 7.7 tablet at the IFA Show in Berlin last Thursday, but already it has been banned by a German court from promoting the new device. In the latest round of its ongoing global patent battle with Apple, a Dusseldorf court has ordered the South Korean company to stop promoting the Galaxy Tab 7.7 with immediate effect. "The product is not on sale yet but we've decided to respect the court order," says Samsung spokesman James Chung. 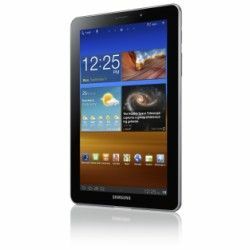 The move follows an earlier ban on German sales of Samsung's Galaxy Tab 10.1 by the same court in late August, with a final ruling due on September 9th. As a result, Samsung was unable to display the Galaxy Tab 10.1 on its stand at IFA.